Shopping for kids in New York - share your own finds! Shopping for kids in New York – share your own finds! New York, the great melting pot of all that is hip, urban and ultra-expensive. I was there in September for two weeks, and despite going without my children – and with the intention of relishing my individual self again – I couldn’t help but pop in to some fine children’s stores. The beauty of my time away was that I got to have that blessed break, with the added bonus of coming home to my beloved little boys… with loads of presents for them. As I settled back into family life, my photos just sat there for a month or so… until we received an email from Babyology reader Shona. Having noted my mention of my recent New York trip, Shona asked if I could share some of my ‘finds’. So here are some of my favourites; and if you’ve got some of your own New York gems, we’d love you to share them with us! Yoya has to be one of the most drool-worthy children’s stores ever. The window displays had me riveted, filled with elite goodies from all over the globe. I had to be buzzed in, and once inside I had to stop myself from gawking, particularly at the clothes. Labels such as Gaby Basora, Neige and Antik Batik must be thrilling the local fashionistas, as would be furniture from Bloom, Spot On Square and Nurseryworks. We’ve featured a few products from Yoya in the past on Babyology, check them out here. Yoya is well worth a visit at either of its two locations. I was delighted to see Australian brands such as Raggidy Rag Dolls and Munster in this ultra-chic boutique. The staff were super-friendly and happily gave me directions and chatted for a while. Luxury children’s fashion and toys are huge passions at Estella; every item was notable and exceptional. Pop in to Estella in Greenwich Village. If you can’t, they might ship an order to Australia – I’m assuming they just forgot to list us on the shipping page! Little Marc Jacobs is one of this top designer’s latest incarnations. His three stores on Bleecker Street in Greenwich Village literally have people lining up to get in, and his shop for children is choc-full of delights I wanted to bring home. The animal-themed shoes were standouts for me, and the clothes and toys were luxurious and beautifully made. I visited the store at 382 Bleecker Street, West Village. It’s tiny, chic and always busy… and right near Magnolia Bakery. The Red Velvet cupcakes are an absolute must! The respect and affection I have for my well-worn 2005 Kate Spade polka-dot Maclaren makes it very difficult for me to trade it in for a new shiny one. But you can imagine the temptation I felt when I stumbled across the New York Maclaren shop whilst exploring the inimitable, awe-inspiring SoHo district. 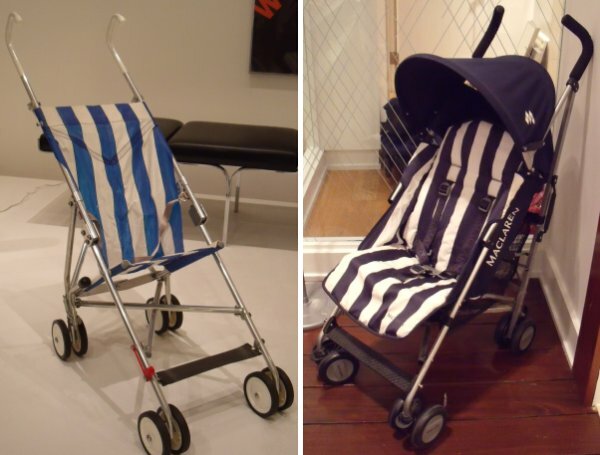 Having been very excited the day before when I found the original Butcher’s Stripe Maclaren at the Museum of Modern Art (left), I just had to snap a picture of the current re-release of the classic design which started it all (right) – a world-wide phenomenon in baby transportation. I loved the collection of pram liners in retro fabrics, plus seeing the range of Netto Collection furniture which Mandi covered at the ABC Kids Expo. It was also a thrill to see models we don’t have here in Australia, like the Shanghai Tang. My friend once went to great lengths to procure one of these! The cool approachability of Brooklyn can be a refreshing change from the hype and glamour of Manhattan. I was quite taken with the low-rise, widely spaced buildings and relaxed vibe. Roaming one day, I came across Mini Max Toys and Cuts, which is a quality toy store doubling as a kids’ hair salon. Kids can jump into car-themed seats and watch DVDs while their locks are fashioned into hipster shag-cuts. I loved the Thomas-compatible New York subway trains, and the Dante Beatrix bags and lunch packs, which I coveted first back in October 2008. The store also features locally made fashion. If you have the kids with you, check the schedule for the storytelling, arts and crafts and puppet shows which are held weekly. I love the community involvement in this locally-run business! My little list was never meant to be exhaustive, and while I explored a lot of West Village, Midtown and SoHo, perhaps you know of some boutiques in the Lower East Side or Uptown. Please share with us and Shona, so she and all those planning a trip to the wild and wonderful New York can go prepared to hit the shops! Agatha Ruiz de la Prada – Eye-poppingly bright boutique in SoHo. I didn’t see anything for boys but the girls’ apparel was to die for. Kid O – Still kicking myself I didn’t get to this amazing children’s design shop in West Village. 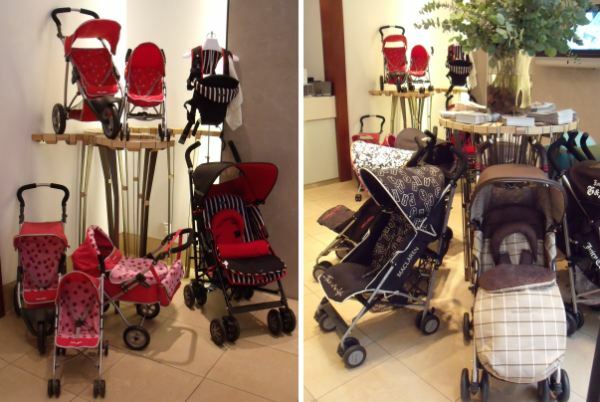 Giggle – A super-chic SoHo baby store which stocks all of the most desirable goodies from fab brands. I wanted to stay in there for much longer but had to meet my travelling companions who were long past being patient with me looking in baby stores. Giggle strikes the perfect balance by stocking all the big quality brands like Dwell and Stokke, but also featuring some smaller boutique ranges. Macy’s – You mustn’t miss out on this gobsmackingly huge department store. I was delighted to find some Small Paul bargains in amongst the thousands of racks. I lost hours in here. Century21 – Stocks some elite brands at a fraction of the usual prices. Worth a visit after you see the site of World Trade Centre – I needed some urgent retail-therapy to escape from the sense of tragedy.